Are you giving your customers free WiFi? If so, what are you getting in return? What if you could take that WiFi and send offers and newsletters directly to your customers? Well, now you can. And it’s so simple! Marketing your business and managing your technology is hard work, and you need someone in your corner to help deal with details. Why not let Symban take that off your plate? 40% of your daily guests already, or will, connect to your guest WiFi making it the most effective way you can engage with them. Indoor or outdoor, small cafe or large hotel, we’ve got you covered. Our WiFi solutions will help you grow your social media following and allow you to tap it for real growth. You connect with your customers and watch as your customers connect you with everyone else! Give them SMART WiFi instead! Instead of the headaches you get from standard guest WiFi, how about getting these benefits? 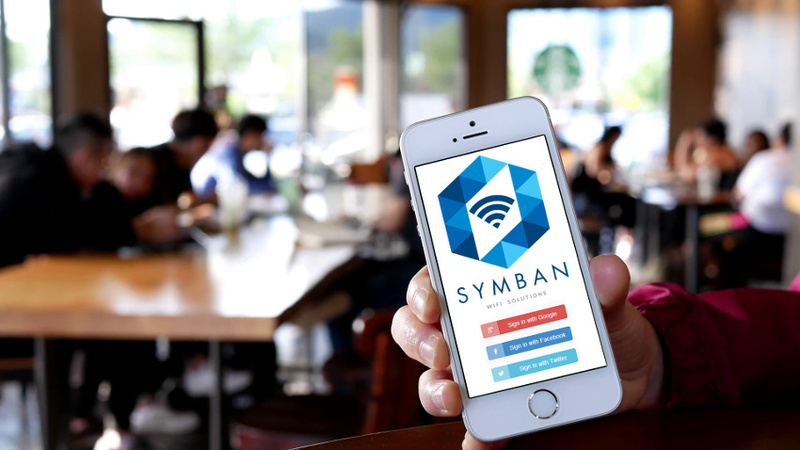 When your guests want access to the Internet at your establishment, they simply choose the Symban WiFi network on their device. No more passwords to hand out! Next, they’re presented with a beautiful, mobile- friendly, completely branded connection page that displays your information. It also can display scrolling promotions or specials that you can add and change as often as you like from within our administration dashboard. You, as the owner, have access 24/7 to the dashboard. The guest then simply clicks ‘connect’ and chooses the method to connect, whether through their social media account or just by using their e-mail address. It’s as simple as that! Your guest is online and ready to surf the net just as they would at home to check their e-mail, check their social media accounts or any other activity. We can limit their connection time based on your business needs to prevent “table parking” and we limit the bandwidth allocated to them so that every user receives a stable connection and your merchant and back-office systems always have the bandwidth they need to function.